“There’s no place like home for the holidays…” drums through my brain like a broken record. I think it is a subconscious manifestation of my desire to spend the long, cold winter hibernating with the bears here in Craig, Alaska. But, since there is no rest for the weary, I find myself moving again for the fourth time in less than five years. “So, where is home?”, I ask myself. My life on planet Earth has not quite made 60 trips around the sun, but from my experience it seems that “home” takes on different meanings depending upon where and when it presents itself in the space-time continuum. Some people associate the scent of pine needles with Christmas, but for me it is the aroma of Grandma’s cooking. When I was a kid in the sixties, we lived with my paternal grandparents until I was seven, so “home” meant three generations under one roof with an overabundance of strudel at Christmas time, not to mention stuffed cabbage, breaded chicken, and nut rolls. If we were lucky, Aunt Sylvia would send over extra goodies like her delicious thumb print cookies and apricot pastries. We had a bright, shiny aluminum fake Christmas tree in our small living room. Every year Mom and Dad would get out the tree (stored in its original box), and we would pop each poufy branch out of its paper tube and attach it to the silver tree trunk. With all the branches in place, I thought the silver tree appeared dazzling with ornaments old and new gracing those sparkly branches. My dad’s beloved model train circled beneath the tree every year since I can remember. In addition, a growing collection of Christmas cards adorned the large mirror above the living room couch, and Grandpa’s old nativity figures sat in a special place, either on top of the television or under the tree. As time wore on those old shepherds and wise men wore out, and a newer and better manger scene took their place. Fifty years later, I confess that baby Jesus from Grandpa’s old crèche is still hiding in my jewelry box. I think fondly of Grandpa and Christmas Past every time I open it. One day we moved to a “home” a mile away, and Mom and Dad began establishing their own Christmas traditions. Mom wanted a platform for the tree in the worst way and paid someone to make her one. 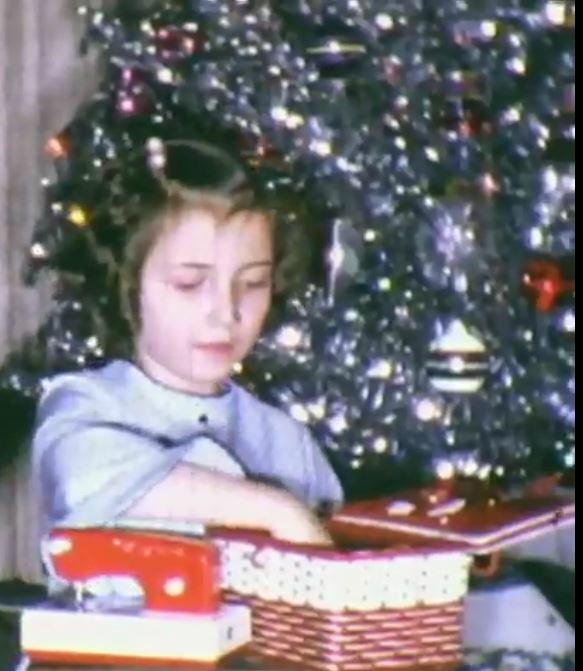 Every year she set up the platform, covered it with some type of Christmas cloth or paper and set the tree on top of it. Something nice about the platform is that you could slide empty boxes or wrapped gifts underneath where they could not be seen. At some point, we got a new fake tree, a life-like green one, to set up on the platform. Mom sewed Christmas ornaments from pre-printed ornament fabric that was very popular at the time. She stuffed them like soft little pillows with loops of gold elastic to hang on the branches. Every Christmas brightly colored little pillows of all varieties weighed down the fake tree, and plastic icicles draped each branch atop the ornaments. Dad set up his train set around the base of the tree just like every year before. The platform made a nice even surface for the track, and we enjoyed playing trains for hours on end. Our family did not go out much, and we did not get together with extended family and friends for big meals or holiday celebrations, so we spent a lot of time looking at the tree platform and playing with the train and nativity figures. Culinary preparations now decentralized from ethnic food to meat and lots of it, such as ham and turkey. Mom wasn’t much into baking, but nevertheless strudels and cookies found their way into our new “home” anyway, either from Grandma or Aunt Sylvia. Sometimes the goodies were leftover donations from Christmas parties at the Duquesne Croatian Club where Grandma worked part-time as a cook. When I became a teenager, some parts of Christmas shifted from family and “home” to my larger world of friends. I loved getting dressed up and going to holiday concerts, the school Christmas dance, and the annual Christmas party for the Duquesne Junior Tamburitzans. I guess I liked spending time with my friends more than family, because what teenager doesn’t? Our family did not attend a specific church, but every year I tried to attend a church service on Christmas Eve. Sometimes I went to midnight mass with the Catholics or other times I worshiped at a candlelight service with Presbyterians. Those first few years of keeping baby Jesus in my jewelry box instinctively made me realize that there would be no Christmas without His birth. I enjoyed feeling the spirit at those gatherings and attempted to sing and play Christmas carols on my guitar when I got “home”. Efforts to include family members usually failed, because I sang too high and screechy, and I got booted out of the living room in no time at all. Then it was off to college and a family of my own and through those years there was always a longing to go “home” to parents and grandparents and lifelong friends — familiar places and faces, dear to the heart but far from what I now called “home”. Of course, we began our family in the late 1970s on the cusp of an economic recession. It was difficult to make ends meet, so “home” moved from one apartment or house to the next. Holiday memories consisted of writing many Christmas cards, sewing homemade gifts, and making long-distance phone calls that lasted ten minutes or less. There was no Facebook or Skype to close the distance gap. I learned to make some of the ethnic dishes my grandma used to feed us (although I am still working on the strudel), and threw in a holiday ham or turkey provided free by my husband’s employer. At long last I entertained the little ones by singing carols with my guitar, and instead of complaining, they sang along. All those little pillow ornaments found their way to my tree followed by printed pillow crèche figures to be tossed around by toddlers, puppies and kitties too! I saved plastic ice cream buckets from Thanksgiving and decorated and filled them with homemade sugar cookies and oranges so my kids could deliver treats to the neighbors. We purposefully set aside all the tasty gifts brought over by reciprocating neighbors to savor during our Special Christmas Eve celebration which took place in our “home” and included the story of baby Jesus and other inspirational tales. After story-telling and movie viewing, the children were sent to bed on a sugar high while we wrapped dollar-store gifts into the daylight hours. After a sleepless night of wrapping and keeping watch for peeking peeps, Christmas morning came, and we napped as the children played, safe and sound, at “home”. My grandmas and grandpas and dad and husband have all gone “home” to Jesus now, spending Christmas on the other side. My mom is in a “home”. And, I am a gray-haired granny hopping from one adult child’s “home” to another, knowing I have family all over the world who love me and allow me to share in their family traditions. Over the past year and a half, new generations of family have taken me places I’ve never been before or have helped me develop new perspectives of places I know like the back of my hand. Recently I have left a piece of my heart in San Francisco, Sasebo, Honolulu, Monterey, Seattle, Phoenix, Juneau, Sacramento, and Prince of Wales Island. It has become clear to me that Home is not the building we dwell in, nor is it a place in which we hibernate. “Home” is, indeed, where the heart is – family, friends, and memories. So, I’ll keep humming that little tune, because whether near or far, there is No Place Like Home for the Holidays! All I can say is…..<3 Merry Christmas Patti!